True ownership of one share of Snapchat stock framed like you want. The recipient becomes a real shareholder of the company. 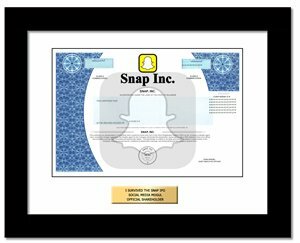 Like most IPOs, Snap does not issue paper stock certificates and registers ownership electronically instead. The recipient still becomes a real shareholder of Snap Inc. with all associated rights. Snap does not issue paper stock certificates but our replica for display purposes is awesome - ornate and modern. Snap just had its IPO Mar 2017. This social media powerhouse is a Millennial fave.